This Friday is Australia Day! Intertops Poker and Juicy Stakes Casino, two online poker rooms popular with Australian poker players, are putting $500 on the table for their Australia Day poker tournament. They're also adding another $500 to the pot for their Sunday Sundowner this weekend – it's now $4000 GTD. Every 26th January Australians come together to celebrate their national day, reflecting the nation's diversity and achievements, its past and future. While there’s been some talk of changing the date, it’s still celebrated on the day the British first raised the flag of Britain in Sydney Cove. There are community events and citizenship ceremonies all over the country and, as it’s the middle of summer Down Under, there are loads of shrimps on the barbie and lots of lager is consumed. 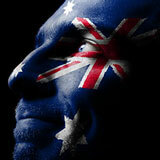 $500 GTD poker tournament on Australia Day and Sunday Sundowner increased to $4000. Also this week, the two Horizon Poker Network poker rooms are increasing the prize money for their Sunday Sundowner tournament. Again. On Sunday, January 28th players will be competing for $4000. Intertops Poker and Juicy Stakes are known all over the world for their busy poker rooms. They also offer a selection of casino games from Betsoft, Worldmatch and Lucktap.